Flohr’s expressionist style perfectly emulates the emotion he observes upon walking along Regent Street, gazing through entrancing window panes, getting lost in the famous London fog. 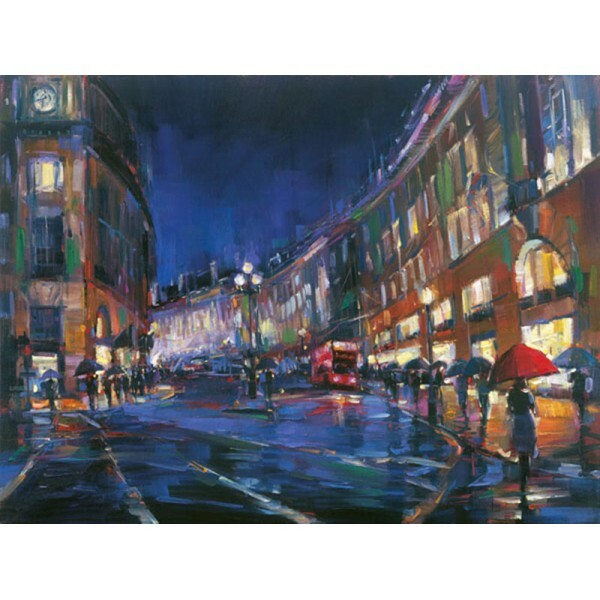 Bright lights of the red double-decker buses reflect off of a delicate drizzle that collects in luminescent puddles, brought forth in Flohr’s deliberate brushstrokes of striking color. As he looks back upon London Rain, he recalls how the rain heightened the sense of romance and comfort amidst the tall curvature of the buildings. Michael Flohr’s body of work is testament to the powerful splendor of fulfilling dreams of travel and our desire to take ourselves out of the ordinary to see the extraordinary. Time and again, his art transports us to beautiful moments in intriguing places.